Who are these guys? The Jazz are getting back to drafting the foreign players again. 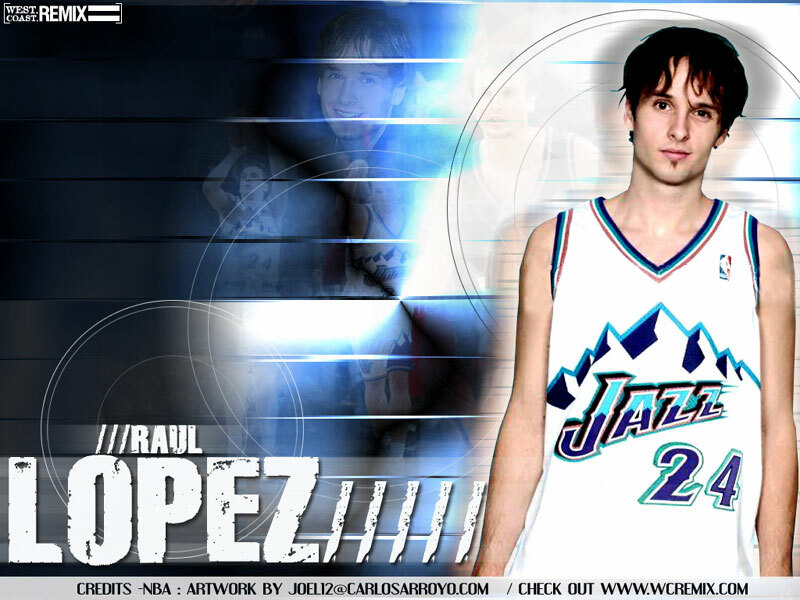 In the past, the Jazz have drafted Martin Muursepp, Kirilenko, Raul Lopez, Sasha Pavlovic, and Pavel Podkolzine. We've had a decent track record of drafting overseas (certainly, Muursepp and Podkolzine shouldn't count, since we got rid of them before they could even say "Salt Lake City"). Kirilenko though, has been the one diamond discovery. And I believe Raul Lopez could have been "something special" if it weren't for his constant knee problems. As each day passes from this draft season, I feel more and more excited about the possiblities of our draft picks. Even though Koufos' heritage comes from Greece, he couldn't be more American (he's got dual citizenship). 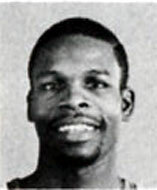 He played high school ball in Canton, Ohio and went to Ohio State for a season. In addition, Koufos was a McDonald's All-American! How much more American can you get? Koufos's game couldn't be more European though. Koufos loves the outside jumper. He can shoot it well. But sometimes, he spends too much time out there. Crazy thing is, he has the body to be a big-time post presence. He's big, has length and is a good athlete. I guess this gives me hope that he'll be able to transition (or at least, develop) into a strong post player. My hope is that he overcomes his "Charmin Soft" reputation as he grows older and gains experience. So, what was the Jazz number that he happened to choose? #41... Dirk Nowitzki! I guess we should get used to seeing Koufos spending alot of time at the 3-point line afterall. At pick #23, you can't go wrong with a big center who has the skillset that Koufos possesses. I'm confident he won't become Luther Wright, Curtis Borchardt, or Eric Leckner. He's just too skilled. 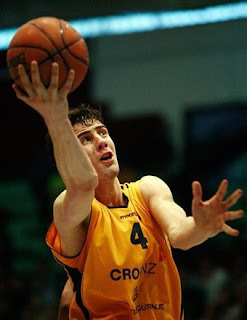 "Ante Tomic likely enjoys the most potential among the second round guys. He really resembles Pau Gasol, minus the body. The length, the low post skills, the mid-range jumper, the court vision, even his ability to put the ball on the floor, but also his softness on defense. Still the guy is just too skinny and his body doesn’t always allow him to display his game as he would like, although he’s faring every year better in the Adriatic League. Anyway, his physical development is taking some serious time, and it will take him several years to be ready for the NBA; if he ever makes it. Still, that’s what the second round is about, and Tomic looks like a very intriguing investment. The question is, will he ever make it considering his contract situation." If the talent is truly there, I'll personnally fly to Croatia for a "Bulk-Up Antic Tomic" campaign. It would consist of me and "Auntie" chowing down on burgers, slirping down chocolate shakes and hitting the weight room. His comparision is Pau Gasol? Are you kidding me? If he's anything close to Pau, let's get him over here! Pronto! Suffice to say...he must be a promising talent. Hopefully, he's able to beef up. Now, I don't think Tadija's bio is quite as glowing, even though he puts up impressive numbers in the Adriatic League (18.4 ppg, 5.4 rpg, 1.1 apg). It sounds like he can shoot the ball but doesn't provide much else for his team. DraftExpress provides their insight on Dragicevic (at the bottom of the page). 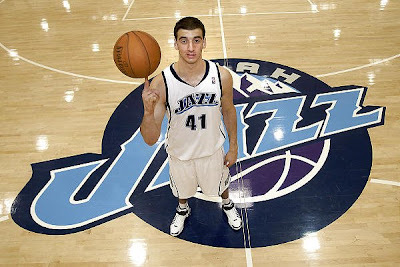 We got great value in the first round with Kosta Koufos. He's a player who could develop into a solid NBA center down the road. Unfortunately, he doesn't quite meet what we need in terms of defense, toughness and aggression. At 23, however, we're not gonna find much better. There were other players available who could have been really intriguing...Chalmers, Arthur, Jordan, Batum and Greene. Yet I realize we were going for a center, and from the centers that were available, Koufos was the most skilled and talented. He was expected to go as high as Indiana at #11 and Golden State at #14. We got a solid pick at #23. I think our hope though (from all of the centers on our roster), may be that Fesenko becomes the intimidator and defensive specialist for us, since I don't think Koufos will provide it. I think we all knew that we'd perform the "Draft and Stash" in the 2nd Round (either that, or get rid of the picks). Our roster just doesn't have the space to accommodate more players. Thus, it was good to go foreign. Tomic, in particular, is a great get at #44. Here's to the investment to he bulks up 25 pounds! I believe it was worth the risk. Tadija, on the other hand, probably won't be worth it. Who knows if he has the talent to make the League? Though, how often do players selected at #53 actually make the roster anyway? We shall see how these foreign players work out for the future. I completely agree with your grade. I think the Tadija pick was a waste, but honestly, what else can you get at that spot? Plaisted? Also, I love the Tomic pick - that late in the draft to get a guy that may become a legitimate threat - no matter how unlikely - is a great pick. I still think we took the wrong guy at #23, but as you say, he's not a total stiff. He may contribute in the future. But he is not the answer to our defensive problems. So, I do not really suppose this is likely to work.